It started out as a crimefighting tool. But over the years, an FBI effort known as “geo-mapping” evolved into something more expansive — a method to track Muslim communities, without any suspicion of a crime being committed. Last month, Danger Room revealed that the FBI was training its agents that religious Muslims tended to be “violent” and that Islamic charity is merely a “funding mechanism for combat.” In response, both the FBI and the Justice Department promised full reviews of their training materials. But the geo-mapping effort indicates that the FBI may have more than just a training problem: The suspicion of ordinary Muslims promoted in those lectures may be spilling over into its counterterrorism tactics. Last week, the American Civil Liberties Union acquired some of the FBI geo-maps (.pdf), like the one pictured after the jump, through a Freedom of Information Act lawsuit. 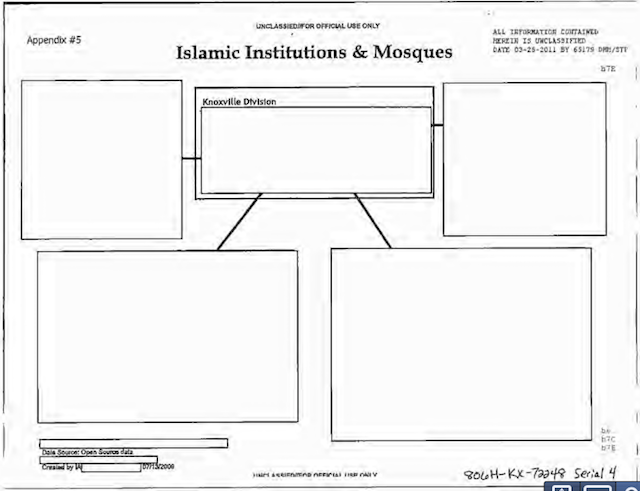 Although many of the maps are heavily redacted, they represent the first public confirmation that the FBI compiles maps of businesses, community centers and religious institutions in ethnic enclaves around the United States. 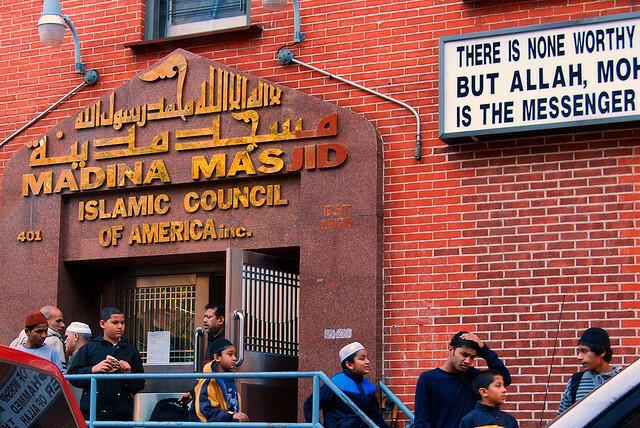 The ACLU — where, full disclosure, my wife works — blasted the mapping effort, and in an interview with the New York Times, FBI agent turned ACLU attorney Mike German tied the maps to the incendiary anti-Islam trainings first revealed by Danger Room. Agents who received the briefings might be “predisposed to treating everyone from a particular group as suspect,” German said. Except FBI geo-mapping isn’t just aimed at tracking criminals. Over time, the maps’ rationale shifted from representing crime scenes to displaying the patterns of life in minority neighborhoods. In other words, the pushpins on the new FBI geo-maps indicate where people live, work, pray, eat and shop, not necessarily where they commit or plan crimes. In 2004, a self-professed “visual learner” in the FBI’s Philadelphia field office, Special Agent Bill Shute, set out to prove a hypothesis. Shute took arrest reports from local cops and court records and plugged it into some off-the-shelf Microsoft mapping software (probably MapPoint) to create a visual display of where crimes occurred on his turf. His theory: If he pounded the pavement in those areas, he’d find informants who’d help him close cases. Shute called his pet mapping effort Project PinPoint. It shouldn’t be surprising: The effort isn’t dissimilar to New York City’s vaunted CompStat program, which displayed crime patterns to inform cops what parts of the city required more police work. Within a year, the FBI’s counterterrorism branch got in on the PinPoint action. Deputy counterterrorism chief Willie Hulon told a congressional panel in 2004 that a massive FBI database called the Investigative Data Warehouse would collect and disseminate the maps amongst FBI agents and partner police forces across the country. “These tools allow FBI agents and analysts to look across multiple cases and multiple data sources to identify relationships and other pieces of information that were not readily available using older FBI systems,” Hulon testified. In December 2008, however, the FBI loosened restrictions on just what “other pieces of information” those maps could collect. Its revised master plan for operations, known as the Domestic Investigational Operations Guidelines, subtly shifted the targets of those maps — from displaying criminal data to displaying data on the communities in which suspected criminals might live. Tell it to Salam al-Marayati. The president of the Muslim Public Affairs Council, one of the U.S.’ most influential Muslim organizations, Marayati wrote a Los Angeles Times op-ed warning that anti-Muslim efforts like the FBI training manual were a nightmare for counterterrorism. Such training will “undermine the relationship between law enforcement and the Muslim American community,” wrote Marayati, who referenced Danger Room’s stories on the subject. The maps can’t be helping. Last week, at a civil rights conference, Deputy Attorney General James Cole reiterated what Danger Room first reported: that the Justice Department will “re-evaluate their training efforts in a range of areas, from community outreach to national security” to scrub out Islamophobic instructions. Already, anti-Muslim authors formerly taught by the FBI, like Robert Spencer, one of the ringleaders of opposition to the so-called “Ground Zero Mosque,” are crying censorship. But Cole didn’t indicate whether the relaxed rules on mapping “ethnic communities” will come under review as part of that scrub.